"I keep telling you, Robin's not for sale!" Faye's beloved pony Robin is everything to her. He's strong brave, responsive... everything a rider needs to win. But Hillcroft Farm is struggling, and Faye can't pretend to ignore it. Not when the truck breaks down and her brother can't fix it. Not when there are calls to the bank, and bills are piling up. Especially not when a willing buyer with deep pockets is waiting to but Robin for his pampered pretty daughter. So Faye makes a tough decision. It feels like the end of the world. And it is... until she catches sight of a whole new world, one that may be hers for the taking. Will she be able to make the jump? 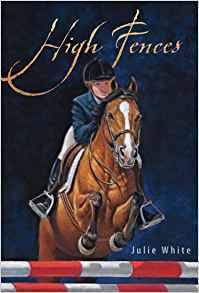 This truly is a GREAT book about friendship, horses, and excitement. I hope you get the chance to read it! woah that sounds REALLY good!!!!!!!!! !